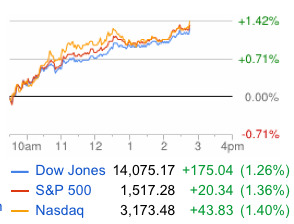 Stocks are staging a big rally .The big news of the morning was the January durable goods report. The headline orders number plunged by 5.2 per cent, which was worse than expectations. But the headline number tends to be noisy due to volatile aircraft orders. Core capex, which is nondefense order excluding aircraft, surged 6.3 per cent. Economist were looking for no growth here.